Today we are faced with the alarming possibility that as many as 50 percent of species alive will become extinct within this century. This statistic is so staggering that scientists have begun to refer to the twenty-first century as the sixth extinction.” But while this is alarming, all hope is not lost; conservation experts across the globe are working tirelessly to preserve our planet for future generations. Passionate and inspiring, Wild Lives is an important and timely reminder of the beauty and fragility of our world and the obligation that every person has towards preserving it. Lori Robinson holds degrees in environmental studies, biology and psychology, and has a life-long passion for wildlife and wild places. She has spent time with the indigenous Achuar of the Ecuador Amazon, the Bushmen of the Kalahari Desert, and the Maasai and Samburu of Kenya. From 2004-2010 she worked for the Jane Goodall Institute as their Africa Adventures Specialist and continues to design, and sometimes lead, safaris for clients to East and Southern Africa. 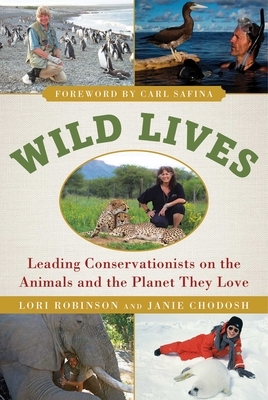 She writes about conservation for various blogs and magazines, including Africa Geographic and her own site, SavingWild.com, and is a fellow of the International League of Conservation Writers. She lives alongside coyote, deer, and rabbits in her small old adobe home in Santa Fe, New Mexico. Janie Chodosh's life work and passion has been a mix of natural history, conservation, and writing. She earned a master’s degree in environmental science from the University of Montana and has worked as a naturalist in Yosemite National Park, a wilderness guide for the Colorado Outward Bound School, a trip leader for the Montana Natural History Center, and as the state education director for the New Mexico chapter of the National Audubon Society. She is currently involved with elephant conservation in Assam, India. She has two novels in the Faith Flores Science Mysteries: Death Spiral (2014, Poisoned Pen Press), and Code Red (February 2017, Poisoned Pen Press). Janie lives in Santa Fe, New Mexico with her husband, daughter, stepson, and dog, Bryn.